BIM & LEAN / COLLABORATIVE CONSTRUCTION DELIVERY – If only we could get there! Building Information Modelling (BIM) is the integration of disparate competencies, business processes, and technologies to accomplish the efficient life-cycle management of the built environment. Per the above definition, BIM has not moved from theory to reality to any significant extent. Improving facility and infrastructure construction, management, operations, and sustainability is indeed possible, if Owners provide competent leadership. Owners must also recognize the value of collaboration, LEAN management methods, and information-based decision-making. The fundamental way in which Owners, Architects, Engineers, Contractors, Building Users, and Oversight Groups interact must change. The issue is not, nor has ever been, shortcomings in technology. The vacuum is one of lack of change management skills and lack of overall asset life-cycle management competency. Asset life-cycle management, as demonstrated in the figure below, requires an integration of business areas and competencies. The primary driver is actually the construction delivery method. It is the construction delivery method that contractually defines roles, responsibilities, timelines, deliverables, relationships, and sets the tone for a project from day one. The construction delivery method can actually REQUIRE COLLABORATION of all participants, right down to the terms, definitions, and information used. Thus a collaborative construction delivery CONTRACT and its associated OPERATIONS or EXECUTION MANUAL are the detailed road map to completed a significantly higher percentage (90%+) of quality renovation, repair, and construction projects on-time and on-budget, and to the satisfaction of ALL participants. Collaborative construction delivery methods such as Integrated Project Delivery, IPD for major new construction, and Job Order Contracting, JOC, for renovation, repair, maintenance, and minor new construction aren’t new. The both have proven track records spanning decades. So, why isn’t everyone using collaborative construction delivery methods, and why aren’t 90% of projects delivered on-time and on-budget? The answer has already been noted… owners are providing the necessary competent leadership, and many players are satisfied with the status quo. It’s not simply a a learning curve issues, it’s a culture change. The multi-party nature, required financial transparency, and sharing of risk and reward is a definite hurdle for many. Some current owners, contractors, and AE’s, quite simply, won’t be able to make the required transition. Would it not be nice to stop focusing upon pretty 3D pictures, dated IWMS systems, and other technologies that dictate process and/or embed antagonistic workflows? As stated previously, technology isn’t the solution, it can however be a crutch, and a problem… if it prevents us from asking the right questions… and dealing with positive change. If you consider BIM to be the solution to low construction productivity, think again. 3D visualization and technology will do little to solve construction project delivery woes. The root of the decades long decline in construction productivity and associated poor facility management practices is cultural. Construction is like any other relatively complex manufacturing process. It requires a focus upon best management practices, education and training, key performance indicators, and continuous improvement, in short, LEAN business process application. Reducing end product variability, cycle-times, waste, and cost is not rocket science. There are multiple proven LEAN construction delivery methods and life-cycle / total cost-of-ownership models available. Owners must drive their accelerated adoption. The most widely used and successful LEAN construction delivery methods are Integrated Project Delivery, IPD, for major new construction, and Job Order Contracting, JOC, for renovation, repair, maintenance, sustainability, and minor new construction. When deployed and managed properly by Owners, on-time, on-budget, quality construction is the norm versus the exception. Why Construction Productivity is Low vs. every other sector. Construction productivity remains low, if not in decline ( with the exception of an uptick due to the multi-billion dollar federal government “shovel ready” investments of 2007/8) due to the continued use of archaic, antagonistic, and counterproductive construction delivery methods such as design-bid-build. Until the Architecture, Engineering, Construction, Owner, and Operation – AEC / AECOO – industry adopts collaborative construction delivery methods such as integrated project delivery – IPD, and job order contracting, JOC little with change. Owners are singularly responsible for the longstanding problems as they lack the knowledge and/or capability and/or incentive to adopt life-cycle management philosophies vs. an outdated first-cost mentality. Technology is not the issue, it is the refusal of Owners to demand basic, fundamental business process changes as so may other industries have already done. IPD/JOC and other LEAN business processes are neither new, nor difficult to implement. Do Owner require a legal mandate to force change? Personally, I don’t like this solution, however, environment and economic imperatives may force this approach? Forget 3D visualization, life-cycle management of the built environment supported by digital technology, BIM, is all about people, process, and competency-centric technologies. If your organization is serious about BIM, here are some areas to consider! Ontology was originally reserved as a philosophical exercise dealing with categorization, analysis, and inter-relationships. Ontology is now a rapidly evolving science in response to increasing complex information systems and/or “big data”. Specific to the built-environment life-cycle management BLM / BIM, ontology is a fundamental requirement as it’s needed to establish robust, coherent, and consistent representations of ever-changing information. This information comes from a variety of competencies, processes, and technologies and must be aggregated and harmonized to enabling enhanced decision-support mechanisms and overall improvement in resources allocation. Common methods support comparable outputs! If one had to name the single most important aspect of BIM, I would select the project delivery method. Collaborative methods are a requirement. They set the tone, establish responsibilities, and determine if/how information is shared (as well as when and the format)… and ultimately determine the success or failure. The good news is they are not new and they are proven. The bad is that the market has cultural objection to change and to sharing. Examples of collaborative methods are Integrated Project Delivery, IPD, Job Order Contracting, JOC, Public Private Partnerships, PPP, etc. Equally important is a life-cycle view vs. first cost mentality. This provides true value for everyone and removes the disadvantages associated with low bid. I have been blessed to be able to work with the largest Owners across all market sectors as well as contractors, subs, and AEs of all sizes. My focus is upon both the strategic aspects of life-cycle management and tactical implementation supported by technology and robust data architectures. As we all know, there’s a lot of dysfunction in the AECOO market, Folks continue to attempt to reinvent the wheel despite proven business best practices, vendors (especially software) mislead by saying the “do everything”…especially the IWMS folks. Also the BIM focus has largely focused upon 3D visualization and many don’t even understand life-cycle management, requirements, and/or metrics. The 3D visualization aspect BIM has little true value at the moment other that pretty pictures, crash detection, and prefabrication (specific material vendors). 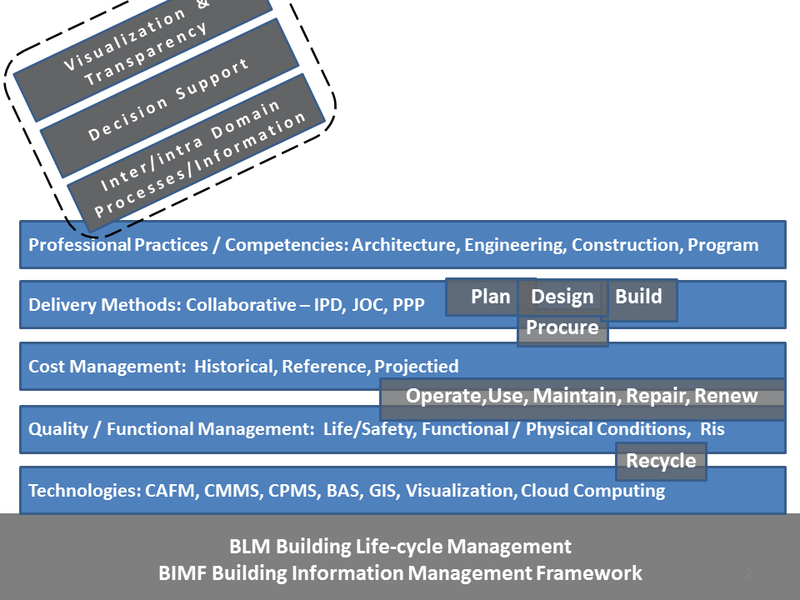 BIM is really BLM (built-environment life-cycle management) and therefore must support a as framework of collaborative project delivery. Many/most current methods and models only support linear and/or serial processes vs. parallel co-existent cycles. A BIM / BLM primary issue that has been largely avoided to date is the lack of a robust BLM (built-environment life-cycle management) ONOTLOGY. BLM/BIM will continue to be impossible without one. For starters what is a life-cycle…what are the primary phases…competencies…technologies… metrics…? There is a reason BLM/BIM has stagnated… and this is it. Is there a BIM/BLM clear mission statement, clear value. proposition, robust ontology….documented proven business best practices, quantitative metrics… all of these must precede technology. Tech is just an enabler for cost-efficient deployment, etc. 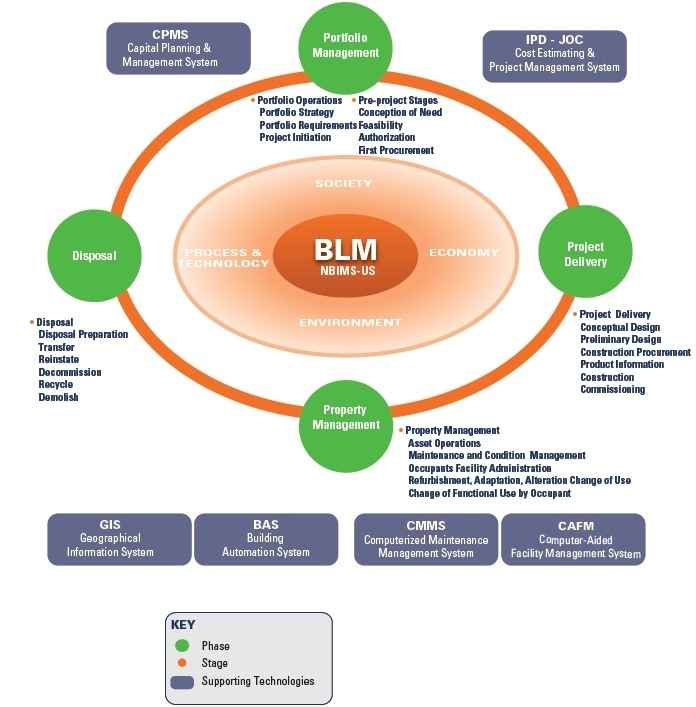 BLM – Building Life-cycle Management requires fundamental process changes within all participating organizations / stakeholders and the associated integration and use of multiple competencies, processes, and technologies. 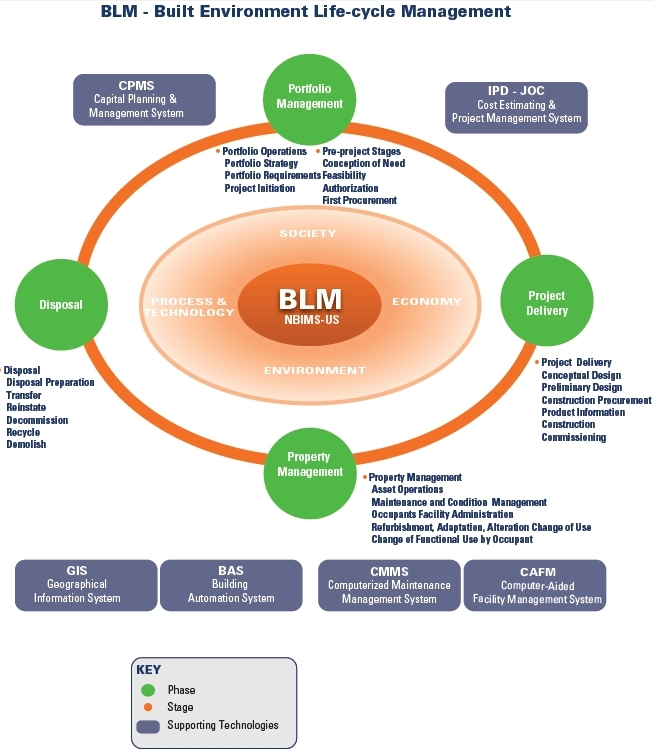 Here’s a short list of considerations, features, requirements, and realizations associated with BLM. 2. Organizations don’t deal well with change. Some will succeed, many will fail. information abundance. “Big Data” is here. Large amounts of data (volume) and it has brought an ever increasing rapid pace of data acquisition, complexity of the data, structured and unstructured data, multiple data sources. 4. Cloud computing technologies and new storage and indexing strategies are rapidly being developed and deployed to handle volume and velocity of information: Schema mapping, Controlled vocabularies, Knowledge representations, Ontologies and semantic technologies,. 5. Despite the above there remains surprisingly little collaboration within the AECOO sector(s) (Architecture, Engineering, Construction, Operations, Owner). As as result advancements are slow and productivity gains remain elusive. 6. 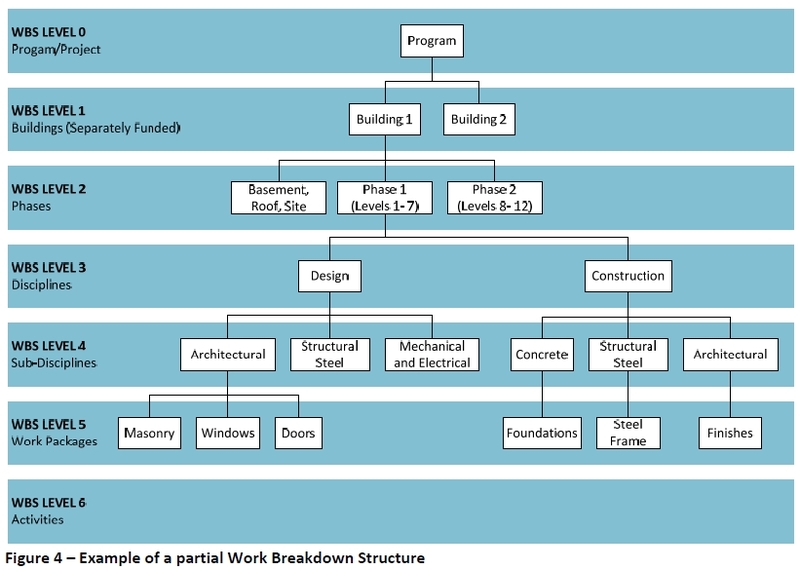 Traditional techniques, processes, and methods…such as design-bid-built, are ineffective/inadequate and giving way to collaborative construction delivery methods such as Integrated Project Delivery (IPD), and Job Order Contracting (JOC). BIM is the life-cycle management of the built environment supported by digital technologies. 1. No mention of the need for collaborative project delivery methods, examples in construction sector being IPD – Integrate Project Delivery and JOC – Job Order Contracting. I argue that EVM is little more than an accounting number crunching exercise unless embedded within a collaborative project delivery methods. (History BTW proves me write on this… just as in the case of ISO 9000, consultant made millions while little true improvement in fundamental business processes was gained). 2. No mention of functional as well as physical metrics. Both are required in terms of a product, building, etc. A complete ontology for each sector (built infrastructure, products, etc.). A life-cycle management strategy noting all required competencies, process, technologies, stakeholder, etc. etc. And a rich listing of metrics. What is wrong with ” The Business Value of BIM for Construction in Major Global Markets: How Contractors Around the World are Driving Innovation with Building Information Modeling” ? 1. The report exclusively deals with construction companies. The most significant value of BIM is to Owners and the associated collaboration among Owners, AEs, Contractors, Subs, Building Users, Oversight Groups, …..
2. There appears to be no specific definition of BIM. Thus, what are the respondents really responding to and/or commenting upon? 3. The report states “…BIM adoption in North American skyrocketed from 28% to 71% between 2007 and 2012…”. Does anyone out there actually believe this based upon the BIM defintion I have provided below? I certainly don not. BTW… 71% of what exactly—727 contractors globally—65% large GCs and 44% small contractors? Larger contractors/small contractors… all contractors, contractors surveyed, what does “adoption” mean? …. 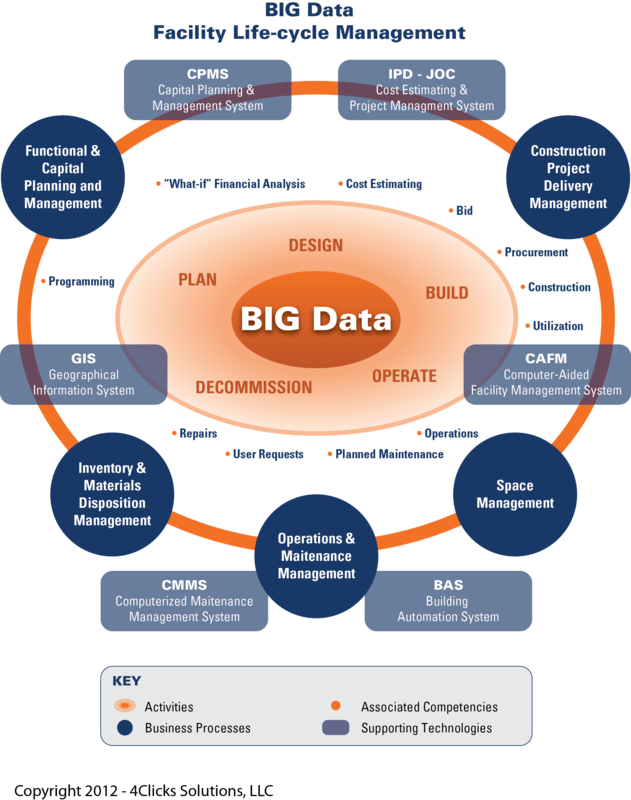 Building Information Management: Is the ORGANIZATION & CONTROL of the business process by utilizing the information in the digital prototype to effect the sharing of information over the entire lifecycle of an asset. The benefits include centralized and visual communication, early exploration of options, sustainability, efficient design, integration of disciplines, site control, as built documentation, etc.–effectively developing an asset life-cycle process and model from conception to final retirement. Building Information Model: Is the DIGITAL REPRESENTATION of physical and functional characteristics of a facility. As such it serves as a shared knowledge resource for information about a facility, forming a reliable basis for decisions during its life-cycle from inception onwards. Building Information Modeling: Is a BUSINESS PROCESS for generating and leveraging building data to design, construct and operate the building during its life-cycle. BIM allows all stakeholders to have access to the same information at the same time through interoperability between technology platforms. The Architecture, Engineering, Construction, Operations, Owner (AECOO) sector must engage in collaborative construction delivery methods in over achieve any measurable performance improvement in the life-cycle management of the built environment. Building Information Management: Is the ORGANIZATION & CONTROL of the business process by utilizing the information in the digital prototype to effect the sharing of information over the entire lifecycle of an asset. The benefits include centralized and visual communication, early exploration of options, sustainability, efficient design, integration of disciplines, site control, as built documentation, etc.–effectively developing an asset lifecycle process and model from conception to final retirement. Building Information Model: Is the DIGITAL REPRESENTATION of physical and functional characteristics of a facility. As such it serves as a shared knowledge resource for information about a facility, forming a reliable basis for decisions during its life cycle from inception onwards. Building Information Modeling: Is a BUSINESS PROCESS for generating and leveraging building data to design, construct and operate the building during its lifecycle. BIM allows all stakeholders to have access to the same information at the same time through interoperability between technology platforms. BIM spans many areas as noted above…Management, Model, and Modeling. The model includes geometry, spatial relationships, geographic information, quantities and physical and functional properties of components and systems associated with the built environment. BIM information spans one or all aspects of the life-cycle of the built environment from concept thru deconstruction/reuse. Achieving life-cycle management requires fundamental changes in how all stakeholders (Architects, Engineers, Contractors, Subs, Owners, Business Product Manufactures, Oversight Groups…) function on a day to day basis. Enhanced data sharing, early on in any project, is a requirement and not all participants will be capable of the change. People, technology, and business process must function holistically and leverage a robust ontology spanning specifications, standards, regulations, manufacturer product specifications, cost, procurement, and project delivery details, environmental aspects, submittal processes. All working together. Disparate competencies, business process, and technologies combine into ongoing information repository to drive more effective decision support. Collaborative construction delivery methods such as IPD – Integrated Project Delivery for new construction, and JOC – job order contracting – for repair, renovation, sustainability, and minor new construction are requisite components of BIM. Forget design-bid-built, and even design-built. Move away from ad-hoc, antagonistic construction delivery methods. It is the construction delivery methods that sets the tone and outlines the specific goals, timelines, relationships, and deliverables for a project. It does so from an overall process perspective as well as detailed tasks level, with associated stages. It is the construction delivery methods that has the single most impacts upon whether or not a project is is completed, correctly, on time and on budget. So, why is BIM not taking off? Far too many AECOO participants are resisting a collaborative process. They see benefit in limiting information access and transparency. They simply believe that “my way is the best way”, and many believe that there domain is an “art” vs. a experience-based profession. Will BIM and efficient project delivery methods lead to major stakeholder services becoming commodities and/or lessening participants value? Of course not. In fact, just the opposite, skill must increase, and the ability to work with multiple players, processes, and technologies are all requirements. Value will be places upon information vs. data. Collaboration vs. silo-based actions. Visualization of information will be critical, not 3D pretty pictures. Standardized metrics will be the norm. Standardized cost databases, unit price books, specifications linked tasks, comparison of internal vs. average costs, shared risk/reward, virtual elimination of legal disputes and mitigation of change orders, processes that guide vs. mandate behavior, localized management with global oversight… welcome to the new world. via http://www.4Clicks.com – Premier cost estimating and efficient project delivery software solutions for JOC, SABER, IDIQ, MATOC, SATOC, MACC, POCA, BOA, BOS … featuring an exclusively enhanced 400,000 line item RSMeans Cost Database, visual estimating/automatic quantity take off ( QTO), and collaborative contract/project/document management, all in one application. Our technology is currently serving over 85% of United States Air Force bases and rapidly growing numbers of other DOD and non-DOD (United States Army Corps of Engineers, Army, GSA, Homeland Security, VA..) federal departments/agencies, as well as state/county/local governments, colleges/universities, healthcare, and airports/transportation. RSMeans strategic partner.